This charming home has the charm of yesteryear with today's modern conveniences! Fabulous updates are found throughout! Hardwood floors are found in manner of the rooms. 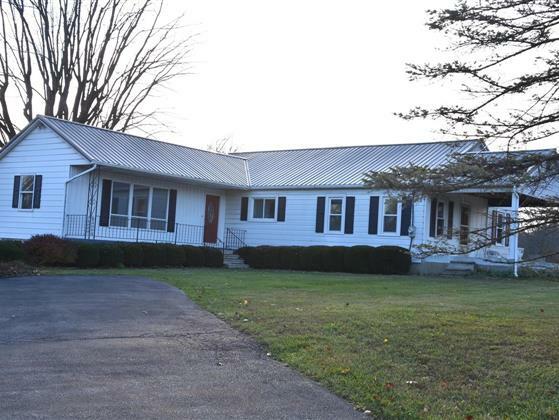 This 3-bedroom ranch/bungalow with two full baths is sure to please. There is a large living room upon entry with new carpet. The kitchen has new appliances, including a side-by-side refrigerator with ice and water in door. There is a kitchen island and lots of countertop space available. The attractive cabinets have been painted, as well as, countertop. The laminate flooring in the kitchen looks great! The kitchen sink is new. The home has been freshly painted throughout. There is a new front door and back door. The metal roof was installed in late Summer. A Presby septic system was installed this Summer. Both baths have been updated. There is a high-efficiency (95%) gas furnace (less than year old) with Space-Gard air cleaner. Sited on over 5 acres the home offers plenty of roaming room. Enjoy the mini-farm setting!